This is a fantastic organization and if you live in the Central Alberta area and have recently adopted give her a call. 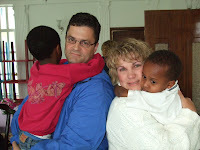 Celebrating Adoption is all over North America. In Canada it is in Ontario and Alberta....so far. Rod put together this video highlighting our trip....it was hard to just do highlights. He did a great job and it will be a nice keepsake for the girls. 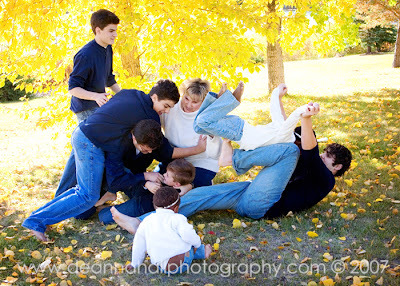 It's hard to believe that we are home and have started our life together as a family of 8. We are so blessed and I hope you enjoy the video.....I did!!! Well, it’s been many weeks since I last wrote down some thoughts. We arrived home the afternoon of September 6th. We were fried from the travel but it sure was great to be back home and see the rest of our family. On the final stretch home, Deb and I talked a lot about how much we missed the rest of our kids. 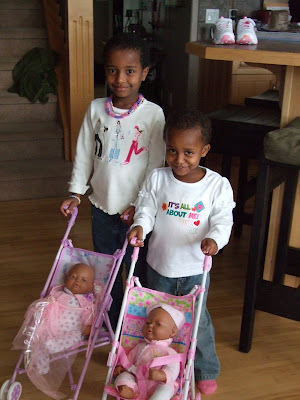 As exciting as it was to go to Ethiopia to bring home Denaye and Maya, we were more excited t o return home and get back to a "normal" life.By normal we mean routine. Believe me nothing is normal around our house. The girls have adapted beautifully. The English words are coming slowly but surely. Maya is already in kindergarten and loving it. They love their big brothers. Whenever any of the boys come home the girls scream their names and run to them to give them hugs and kisses. The boys are loving it. The girls still have their moments when they get on each other nerves. We can’t necessarily understand what the disagreements are about so we have to try our best to be peacemakers anyway. We have a neighbour named Nicki who we are so thankful for. 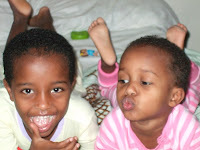 Our son Taylor has a friend Joe...Nicki is his aunt and she speaks Amharic. What a blessing!! Maya has had a couple of moments when she is simply quiet and a little sad. We called Nicki to see if she could find out what the problem was. Maya simply didn’t want to talk about it. Who knows...maybe some memories coming back from Kembata. She cried for a moment and then she was fine. I jokingly said to Deb later....that’s a woman for you!! A good cry and everything is better. Our home feels complete and definitely FULL!! It’s a busy house but a joyful one. We are so thankful to have our daughters and we just love every moment with them. All along we’ve called the adoption of Denaye and Maya a journey.....it definitely has been that.....and the journey continues. Thanks to all of you who have prayed for us, supported us, loved us, and joined us on this journey. We still feel likes it’s just beginning. Well, we’re in the airport in Frankfurt Germany on the way home. It’s been an incredible adventure. But to be honest we’re adventured out, and now we just want to get home. We learned one thing on the flight from Addis to Frankfurt. Denaye hates the seatbelt....but she does like the stroller as long as she’s not belted in. 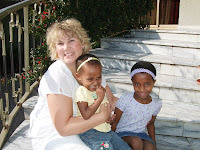 Our last couple of days in Addis were non-stop, hence why I didn’t write. Yesterday we went to one of the largest markets I have ever seen. It stretches for blocks, indoors and outdoors. If you love shoes, you would have been in heaven. Just the number of shoe shops and the variety of shoes was staggering. And there were linens and carvings and spices. Luckily we toured through it with our driver Selamneh. We can’t say enough about Selamneh. 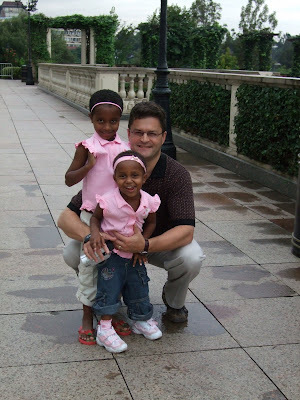 He was not only our tour guide, our driver, but he was also a surrogate father to all the adopted kids. They love him and know him, so when he speaks they listen. He gave Denaye and Maya a little pep talk before we got on the plane about eating unfamiliar food, and they should eat what’s put in front of them because that’s all they’ll get. Ooops, gotta run....we’re boarding. O K, we’re on board the flight to Toronto. One step closer to home. 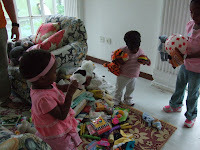 Anyway one of the highlights on this trip was going back to the foster home where the girls had lived, and giving Haregewain the donations we brought from home. We took four bags of stuff, all from our friends back in Edmonton. Thanks to all of you who donate d. I know Haregewain was blown away with your generosity. 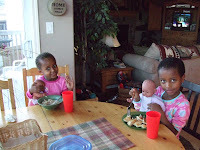 We could tell the foster home was a positive experience for the girls by how they reacted when we arrived. They hugged and kissed all the workers. The workers were all crying. It was quite an emotional scene. 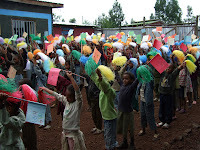 One of our most memorable visits though was later that day...we went to the Liga School. This is a school for kids who basically have nothing. It’s well outside of Addis. The road we took to get to the school was one of the worst we had seen, but we made it....thanks again to Selamneh. 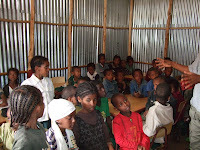 These children are impoverished, some have lost parents to AIDS. The school was started by two university graduates. They used their own money. They just wanted to make a difference and give these kid a chance at a better life. They are now getting some funding through CHOIR...the Canadian Humanitarian Organization for International Relief. The students sang and danced for us. You should have seen the joy in their eyes. They’re thrilled to just be able to be in school learning English. It was an emotional visit for all of us, again reminding us of how fortunate we are to have what we have in Canada, but also reminding us there’s much that we all can do to help. Anyway, I’m pooped. More thoughts later. It’s not that I didn’t want to write the past few days, we just haven’t had time and we’ve both been bagged at night. But I have to say it’s been incredible watching the girls start to come out of their shells. I’m looking at them right now, asleep in the bed beside me and I can’t help but feel thankful. Thankful for lives we enjoy back home, thankful for our kids, including the two new ones. Thankful that God has blessed us so richly. I know I will come home appreciating that a lot more. The girls are so great. 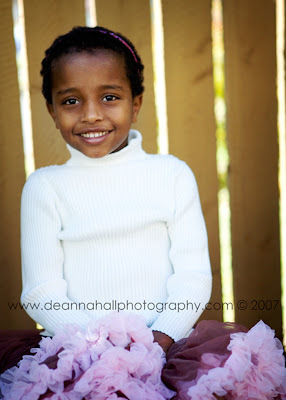 Denaye has been such a little trooper. She has scabies, but on her left foot it turned into impentago, and then that got infected. We took her to the doctor today and he prescribed some medications, so hopefully those will work and at least keep her comfortable on the trip home. The girls are starting to attach to us. They’re more open and cuddly, which of course I love....but we saw a little defiance out of Denaye today and that’s good sign. That might sound strange but it’s true. When we first got them they would do whatever we said. When they start to trust you more...then they’re more comfortable being themselves. We were visiting our friends Jim and Heather Blake at their hotel. Denaye and Maya were playing on the balcony and I told them to come in so we could go down to the pool. Maya came in but Denaye did not. When asked her nicely...she refused. Trust me she knew what I wanted, it had nothing to do with the language barrier. I finally picked her up and brought her inside. She threw a fit...but moments later, she was fine. I’m sure there’ll be many more moments like that. The girls are also leaving food on their plates. That’s also a good sign that shows they’re starting to understand there will always be more so the don’t need to gorge. All we seem to be doing these days is taking the girls to the bathroom.....they both have the runs.....hopefully that will end soon. There are times when they’re quiet, even a little sad, Maya more so than Denaye. We’re trying not to over-think or worry about what that might be about. Maya is afraid at night and she wakes with night terrors. It could be any number of things and we just let it runs it’s course. We just hold them and let them know as best we can that we love them. But we are certainly enjoying the smiles and playfulness. 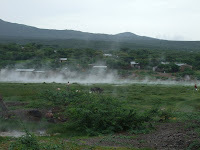 We drove out of Addis yesterday to a hot springs. It’s inside a resort. But the entrance into the resort was flooded because of heavy rains. Thanks goodness our vehicles were diesel. 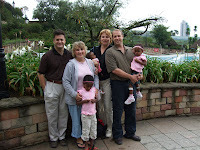 In the hot spring were a couple of hundreds Africans and four white people with black kids. Needless to say we felt a little strange at first but it was fine. The African people were all very friendly and kind. Maya loved the water, it was her first time s wimming and she especially loves sticking her head underwater. We’ll have to do more swimming when we get home. Everyday has been an amazing experience. One of my favourite parts of the trip so far was the drive to and from the resort. I loved just watching the people as we drove through towns and villages. Africa is just an amazingly beautiful country. It’s hard to put into words. We’re taking lots of pictures and will have many stories to tell when we get home. We’re looking very forward to that now. We want to get home and share our beautiful girls with everyone. O.K. I missed a day of journelling but what a day. We got up yesterday morning and went over to the foster home to meet the girls. 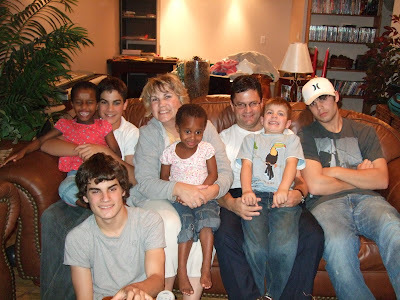 There were seven families all meeting their kids in one large room at the same time. Talk about emotional and chaotic all at the same time. Thos e of you who know Deb know that she is not crier, but we no sooner drove through the gates of the foster home and she started to cry. And when she saw Haregewain, the woman who runs the foster home....they embraced each other and balled. After herding us into the meeting room they brought out the kids. When we saw Denaye and Maya for the first time we both lost it. I’m sure the girls were wondering ,"Who are these people,and why are they crying?" We cried, we hugged...the girls were a little shell-shocked by the whole thing, But the meeting room quickly turned into a playroom when the balloons and bubbles and balls came out. I have to say it was incredible to look around the room and just see the absolute joy on the faces of the chi ldren and their new families. It’s something I know I’ll never forget. I’m not sure how long the play session lasted....but some workers came to take the children and we all looked at each other and said "You can’t take them now." We were then told they were just going to have lunch. Whew!! But shortly after, the discussion began as to whether this was going to be a visit or pick-up. As you might expect the parents all voted for pick-up. After some discussions with Haregewain it was decided we could all take our kids. During the playtime and as we go them ready to leave, even though we had only known them for a couple of hours....there were moments of unexpected hugs and kisses from the girls. And I’ll take all of those I can get. We spent the day with the girls just getting acquainted. The language barrier can be frustrating at times but we’ve learned a few words that help us communicate. We’ve got the one figured out for when they have to go to the bathroom....so that’s good. A loud party near the guest house kept us awake for a good chunk of the night last night. We’re still adapting to the clock so we were both a little wiped out today. But the girls seemed to have a good sleep. This morning before breakfast we bathed our girls for the first time. The bathroom next to our room has only stand-up shower, so we went to someone elses room and borrowed their tub. But their taps didn’t work so we ended up using showerhead anyway. I think we all handled it great. I must say, so far the girls have been agreeable about everything. They are both really good eaters...so that’s been a blessing. After we inhaled breakfast we did a little touring and shopping. 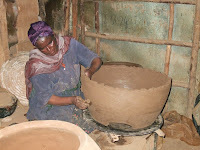 But our drivers took us to a pottery place off the beaten path...down a back road that you could barely drive down. 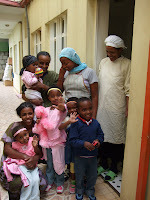 It was our first up close look at the poverty in Addis. Children came up to the van begging for Birr..which is Ethiopian money. Luckily Jim and Heather Blake came stocked with granola bars so the kids got food instead of money. The pottery was incredible, but I think it was a little much for some of the children, maybe a little too familiar. 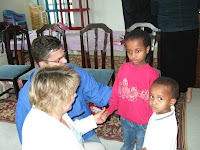 As soon as we entered the place some of the kids held on tighter than ever to the parents. And some wanted to leave. Who knows, maybe it was too vivid a reminder of their earlier lives. We quickly bought some pottery and moved on. Driving from the pottery place to a weaving shop we saw more of the poverty in Addis. There were endless shanty-towns and road-side shops. But the irony for me was in the middle of all th is were lots of happy people. I guess it’s true.....if life gives you lemons..make lemonade. 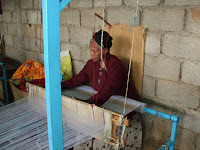 The women at the weavers were using old foot-operated looms and creating the most gorgeous blankets. When you visit these places you don’t just watch...you buy. We had great fun and the old woman doing the weaving loved inter-acting with our kids. After an afternoon nap...tonight Selemnah took us to a traditional Ethiopian restaurant, complete with a band and singers and dancers. The food was amazing, the dancers were incredible and of course I forgot to bring our video camera. Deb and the girls are already fast asleep. And I just wanted to catch you up on what’s been happening. We’re enjoying our time here but we’re eager to get home and show off our amazing daughters. After being pretty quiet yesterday, they started to come out of their shells today....especially Denaye. She was laughing and playing with Maya and the others. When we first got pictures of the girls they looked so sad and all we wanted to do was to make them smile. This morning when Deb was dressing them up.....in pink of course.....she put a really pretty headband on Maya, and she broke out in the biggest smile. That alone made all of this worth it. I am extremely happy and extremely tired. 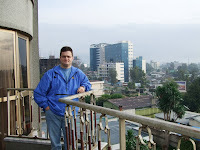 Well after almost two days of traveling we arrived in Addis last night, tired but very happy to finally be here. It’s so different from Canada. After arriving, we stood in line to get into small room to get our Ethiopian visas. Our paperwork checked out, and we paid our 20 U-S dollars...we then walked into this cavernous baggage claim area. The airport here is definitely bare bones compared to the restaurants and museums you find in airports back home. People were everywhere grabbing bags. The had to be x-rayed before we could leave the airport. We no sooner walked into the waiting area when we saw the smiling face of our guide and driver Salemnah. There were four other families in our group all arriving at the same time. It was quite the haul of luggage out to the waiting vans. Luckily Salemnah had other guys with him who helped as well. We no sooner arrived at the Weygoss guest house when Deb dashed off to see our friends Heather and Jim and their new daughter Samra. I could hear their screams of joy two floors up as I dragged luggage up four flights of stairs. Yes we’re on the fourth floor. It’s the top floor and it’s a beautiful room...but there’s no elevator. We should have packed lighter!! 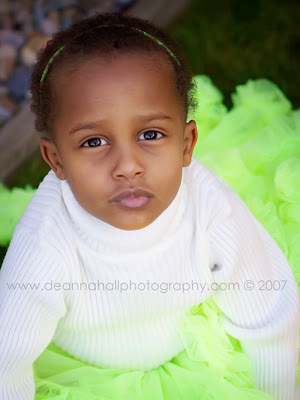 Samra is beautiful and we can’t to meet Denaye and Maya. It’s just after 6 a.m. and the sun is just coming up. We’ve only seen Addis at night. Heather told us you see the poverty in a very real way during the daylight hours. Even as I glance out our fourth f loor I can see the shanty towns all around the guest house. I know we’re going to see things that will shock us, but on the other hand I’m glad we’re able to see this first hand. Then at least we’ll know the real need and maybe be able to do something to help in the future. Right now, our focus is our girls. We meet them later this morning and there is a possibility that we might be able to keep them with us right away. Hey, if they’re ready....we’re ready!! The adoption has been an exciting process, but today it’s very real. I know our lives will never be the same and neither will the lives of Denaye and Maya. Even though they’ve legally been our daughters since June, this is the day when our adventure really begins. I can’t wait to hold them, love them and begin life together. More thoughts later. 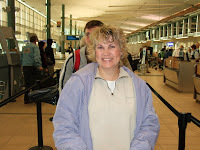 Well, we are sitting in the Toronto airport, and Deb says she has butterflies. 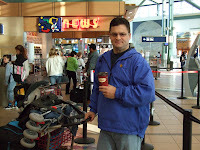 I’m not sure if it’s butterflies about the travel or butterflies about finally going to get our girls. 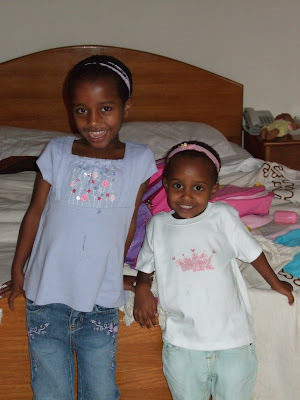 It’s amazing to think that tomorrow (Wednesday) we will be in Addis and on Thursday we’ll finally meet Denaye and Maya . We are so excited about this final step which really is the first step of the rest of our lives. I was looking over the list of Amharic words we were given so we can communicate with the girls. The word that leapt out for me was "konjoi" which means "beautiful". I can’t wait to hold them and tell them how beautiful they are, and how much we love them. I don’t feel butterflies, right now I have just a sense of calm that this is exactly what we’re supposed to be doing at this time in our lives. I know there are going to be lots of adjustments ahead but we’re game!! Even though we’ve had a crazy couple of months of mini-crises leading up to this, God has been good to us. We feel so blessed!! And whatever challenges are ahead, we’ll face them the way we always have....side-by-side....hand-in-hand...Mom & Dad...sons AND daughters...with His hand in ours!! LIFE IS GOOD!! More thoughts later. 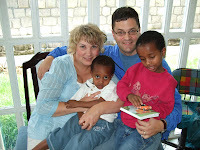 Finally a picture of all of us together......I am hoping to start telling our story of our adventure in Ethiopia sometime over the weekend......now that I am feeling like I am in this timezone!!! Happy birhtday Rod from all of us....your family.....Taylor, Jesse, Kyle, Sam, Maya and Denaye.....and of course me! We are home.......we are exhausted, but very glad to be home. 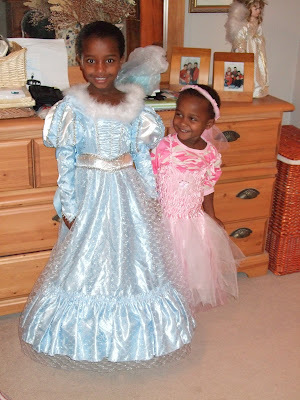 This is Denaye and Maya. It is very nice to see smiles on their faces. I will write more later about our adventures, but thought I would share a picture of them.